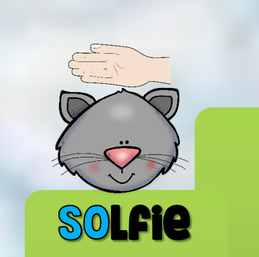 This week I am teaching all my classes a new "Hello" song. We are no longer reciting the class norms. At this point all the students know what they are and where they are posted. We will only recited them from time to time as needed. I want to have something short and sweet that will help the students settle into music. This is a short welcome song that will help students to make the transitions from their classroom to the music room. 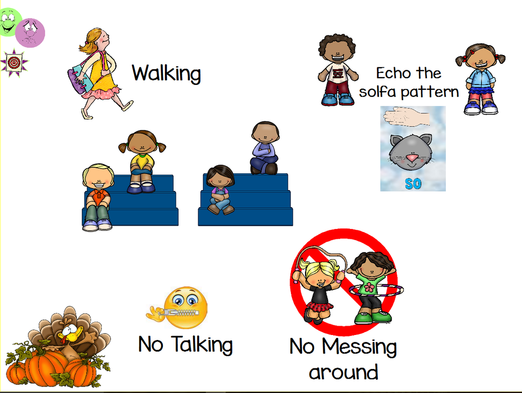 Students need more practice singing their own name and then their neighbor's name. 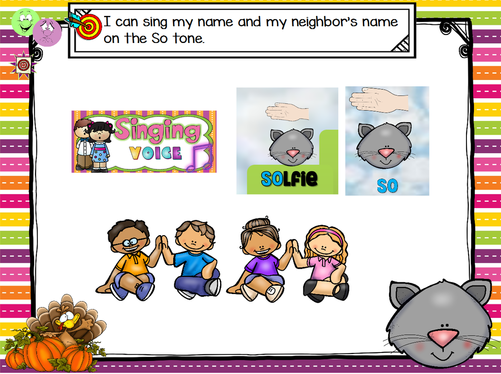 To practice singing on So I had the students say their name and then their neighbor's name while singing on So. Before we began singing our names, I had the students echo patterns on So. Then I started the activity off. I did not give out any stickers. As students transitioned from the circle on the floor to the risers, I had them echo some more patterns on So. I like to use poems with my students to practice saying the words to a steady beat. This month's poem is "I Had a Loose Tooth" by Lillie D. Chaffin. I found out about this poem from one of Rob Amchin's youtube video. Now I got a nickel and a hole in my head. In this week's lesson I said the whole poem without the students. The children just did the motions as I said the poem. Then I had the class say the poem with motions without me. I only did the hand motions. To continue to work on our singing voice, I like to do some pitch exploration. 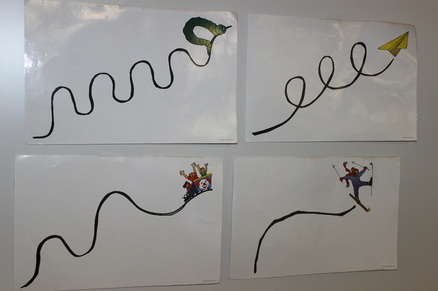 We will be using John Feierabend's Pitch Exploration cards. I only have the children do 4 of them. I usually do each one two or three times. I will do them at different speeds. After we warm-up our voices with sirens, I have the children sing a Song Fragment song. This month's song is "Wise Old Owl" from First Steps in Music, by John Feierabend. The "Drum Game" is a fun way to work on following the conductor cues and to work on listening skills. 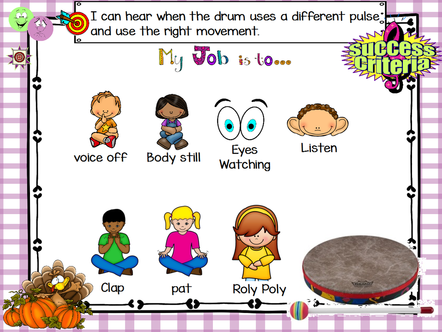 In this activity I play the drum in different ways and students must either clap, pat, or roll their arms (roly poly). If I play quarter notes on the drum, the children will clap their hands to the tempo of the drum. If I play two eighth notes on the drum, the children will pat their hands on their lap. If I do a drum roll on the drum, the children will do a 'roly poly'. Once the children get the hang of it. I will challenge them to do it without me telling them what to do. The children really must listen and be focused. They clap, pat, or do the 'roly poly until I stop playing on the drum. We did this last week, but I felt they need more practice at singing a solo. My focuse today was to get everyone to show respect and to stand still without making any sounds. I used the song "No More Pie". I would sing a phrase and one student will sing back the same phrase. 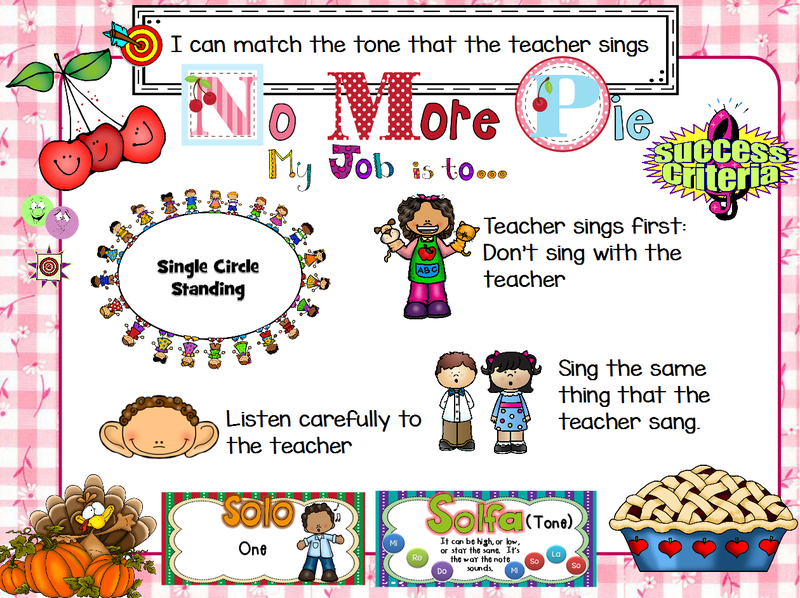 Teacher: "Oh my, no more pie"
Student 1: "Oh my, no more pie"
I continued going around the circle until every child had a chance to sing a solo. Some classes I had to sing the song more than once. As I went around the circle I was assessing who was matching the pitch and who wasn't. Then we put the body percussion on the buckets and drum pads. Each student got one bucket and would lay it upside down and place the drum pad on top. 3. 'coy malindo kiliko kiliko= play the four sixteenths on the drum pad, click sticks twice, play the four sixteenths on the drum pad, hit the side of the bucket once.